The demise of the Soviet Union in 1991 resulted in new state-led nation-building projects in Central Asia. The emergence of independent republics spawned a renewed Western scholarly interest in the region’s nationality issues. Presenting a detailed study, this book examines the state-led nation-building projects in the Soviet republics of Kazakhstan and Uzbekistan. 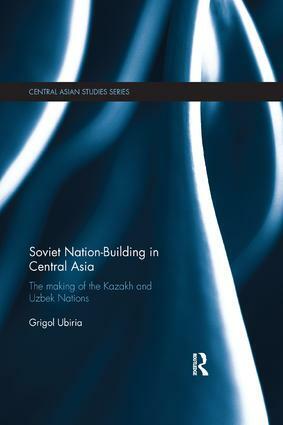 Exploring the degree, forms and ways of the Soviet state involvement in creating Kazakh and Uzbek nations, this book places the discussion within the theoretical literature on nationalism. The author argues that both Kazakh and Uzbek nations are artificial constructs of Moscow-based Soviet policy-makers of the 1920s and 1930s. This book challenges existing arguments in current scholarship by bringing some new and alternative insights into the role of indigenous Central Asian and Soviet officials in these nation-building projects. It goes on to critically examine post-Soviet official Kazakh and Uzbek historiographies, according to which Kazakh and Uzbek peoples had developed national collective identities and loyalties long before the Soviet era. This book will be a useful contribution to Central Asian History and Politics, as well as studies of Nationalism and Soviet Politics. Grigol Ubiria is a Research Associate at the Australian National University’s Centre for Arab and Islamic Studies (the Middle East & Central Asia), Australia.